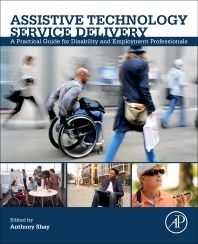 Assistive Technology Service Delivery: A Practical Guide for Disability and Employment Professionals provides professionals working in vocational rehabilitation with the guidelines and methodologies they need to carry out their daily work at a high standard. Crucially, the techniques and tools described in the book are based on evidence gathered in rigorous research. Chapters cover an introduction to the accommodations system, the role of assistive technology as an accommodation and evidence-based practice in vocational rehabilitation, the service delivery process, from referral, through technology procurement and implementation, to the monitoring of outcomes. Drawing on their extensive experience, the authors then present techniques, tools and tips for assistive technology service delivery, with illustrative case study examples. Written with practicing assistive technology professionals and students in mind, this book translates technical knowledge into content that professionals can understand and readily apply. Anthony Shay is a Capacity Building Specialist, Assistive Technologist, and Rehabilitation Specialist with the University of Wisconsin, Stout Vocational Rehabilitation Institute (USA). He holds a Doctoral Degree in Education and a Master’s Degree in Counseling and Psychological Services. He is a WI Licensed Professional Counselor, a Certified Rehabilitation Counselor, and holds an Assistive Technology and Accessible Design Certification. Anthony chairs the Rehabilitation Engineering and Assistive Technology Society of North America’s (RESNA) Vocational Rehabilitation Professional Specialty Group (VRPSG). This text does an excellent job of delineating the components of the Self which have an impact on the effectiveness and motivation to use assistive technology in the workplace. Self-reinforced behavioral motivation to engage in activities while recognizing how assistive technologies reinforce activity and goal striving engagement is key to job maintenance and ultimately consumer satisfaction in employment.